I have a new food reporting obsession. The Atlanta Journal-Constitution‘s recipe finder. On many sites, I’ve had a difficult time searching through recipe archives. My queries for “chicken” wind up netting either zero hits or 23946732875. Even ProQuest fails me at times. So it was a welcome change to discover the AJC’s food page. I admit, I was skeptical of the newspaper’s site at first — the home page was so crammed with advertisements that I thought I hit one of those error pages, where you misspell a word in the URL, so scam artists design a site that looks similar but is just all links and ads. Bottom line: AJC: UR DOIN IT RIGHT. The Journal-Constitution is also doing it right because they’ve hired the talented Jamie Gumbrecht from the Lexington Herald-Leader, where she worked as a pop culture reporter. And although it’s silly that she’s moving away from Seattle instead of closer, I can’t help but be happy for her. Jamie and me in 2003. Just for Jamie, I stepped out of my comfort zone again this week with another cooking-but-it’s-sort-of-baking recipe. 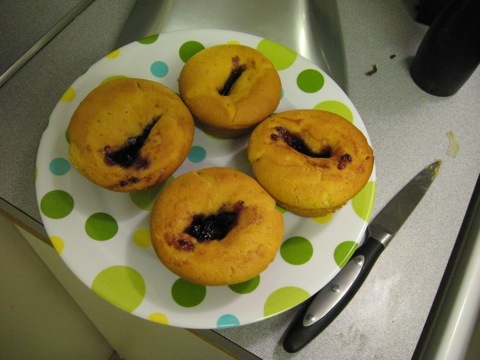 I attempted broccoli corn bread, and then in a flash of inspiration (and because the site was so freaking easy to navigate), I also tried the peanut butter and jelly cupcakes. A note to food page designers: I loved being able to rate the recipes, as well as see how many people rated them. Toby was highly skeptical of the corn bread, but I pointed out that 16 people gave it 4 stars. However, it would have been helpful to know when the recipe was posted and how long the recipes stay posted on the site. I assumed that because 16 people had a chance to try the corn bread, it wasn’t just posted super-recently, but as our Detroit News adventure taught me, I don’t expect it to stay online terribly long. 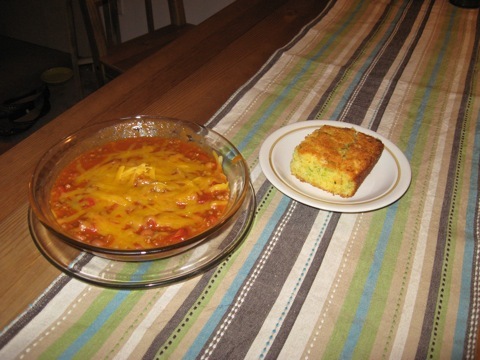 This meal was served with my mom’s fantastic chili recipe, which is not from a newspaper, but is delicious nonetheless. And I should mention that *I* made this entire meal, so you know it’s simple. 1. Preheat oven to 350 degrees. Lightly grease a 9-inch-by-13-inch baking pan. 2. In a mixing bowl, combine corn muffin mix, butter, eggs, cottage cheese, onion and broccoli. 3. 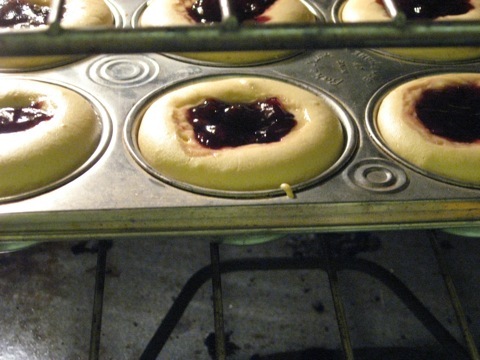 Spread in baking pan and bake until cake tester comes out clean and edges are lightly browned, about 35 to 40 minutes. • Don’t be afraid to overcook this one a bit. It’s extremely moist, so it’s nice to have a crunchier crust. • Toby’s cousin Alex joined us for dinner. 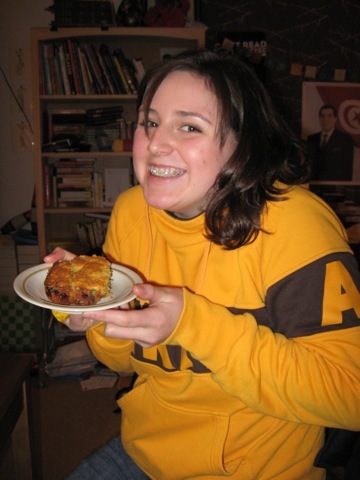 Alex likes corn bread!! 1. Preheat oven to 350 degrees. Line 24 muffin cups with paper liners. 2. In a large bowl, combine the peanut butter and warm milk or water with an electric mixer until well-blended. Add the cake mix, eggs and vegetable oil. Beat 2 minutes, until smooth. 3. Spoon the batter into the lined cups. Drop a teaspoon of jam on top and in the middle of the batter in each cup. Press down on the jam slightly with the back of the teaspoon. Nutrition information per cupcake: 199 calories (percent of calories from fat, 44), 5 grams protein, 24 grams carbohydrates, 1 gram fiber, 10 grams fat (2 grams saturated), 25 milligrams cholesterol, 209 milligrams sodium. • Let’s be frank. (And slightly not safe for work.) If you put too much batter in the cupcake cup, the batter doesn’t completely surround the jelly and you wind up with cupcakes that look a bit like this. I mention this on a practical note, in case you don’t want lady-bits cupcakes at your next office party. If, on the other hand, that suits your purposes, I highly recommend them. • The recipe insists you need paper muffin tin liners, but you don’t. I thought the jelly might seep through the bottom if you didn’t use them, but that wasn’t a problem. • We used Pillsbury yellow cake mix because it was on sale, and it worked just fine.